Lighting is key when you want to make your surroundings bright and inviting. It is required both indoors as well as outdoors such as your patio, backyard, front-yard and garden. With this amazing list of 39 impressive outdoor decorative lights that are about to be presented below, you will get creative ideas on how to make your outdoor more pleasing. The list comprises of ideas that will inspire you to use them to light up your exteriors in more than a million ways, and that too brilliantly. From making use of candles enclosed in mason jars, lanterns of Moroccan style, string lighting on trees, to festoons and origami light fixtures, you have a world of cool outdoor decorative lights at your feet! Do look and make your pick! These glass lanterns or globes are perfect to be hung from branches of trees and lit up using string lights. In the daytime, these glass globes or orbs look golden, but, when sun comes down, the fairy lights inside these orbs start emitting light beautifully. You can hang these from trees or from hooks on your porch. The battery operated fairy lights switch on automatically when sun sets. When its time for you to pack off your woolens and welcome summer, its then that you start planning for beautifying your outdoor seating spots. Lighting plays a crucial part in brightening up a spot, and there are umpteen ways to illuminate these places. In the above image, the decorator has used rattan lanterns that are placed on the side table of a garden seating nook. These add a chic touch to your seating and warm up the contours very gently with their amber LED bulbs. This lantern charges automatically during daytime, and when its evening, it starts radiating light. The lantern can keep illuminating light for close to eight hours. These rattan lanterns can either be placed on tables or hung from their handles. A stunning example of backyard LED lighting can be seen in this image above where the backyard pathway has been lit up warmly with iron lanterns with built-in LED candle lights. 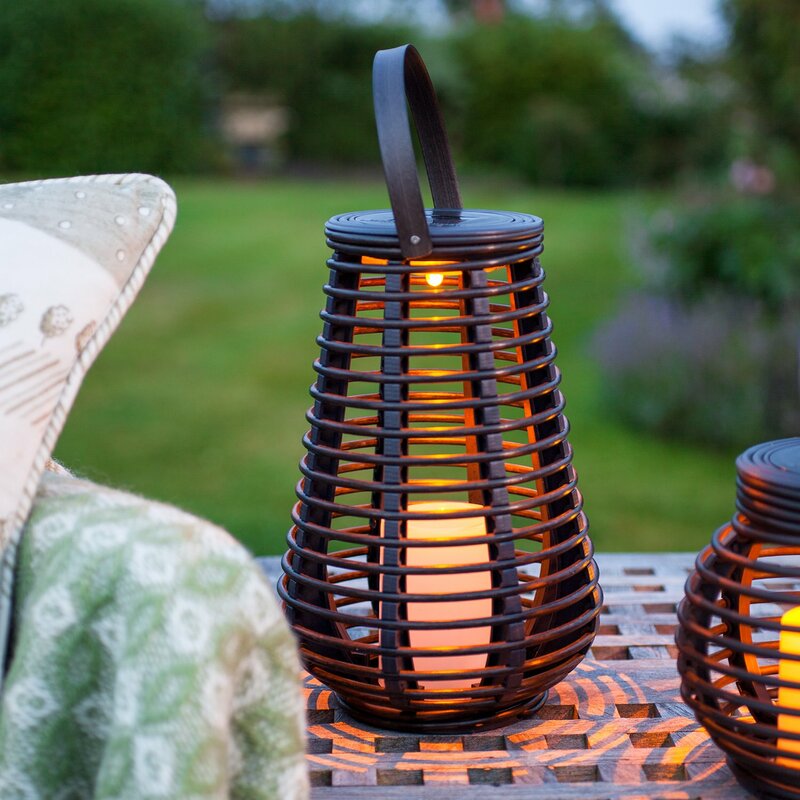 Lanterns such as these will offer ambient lighting to any spot and make the outdoor even more inviting. You can team lanterns with string lights to illuminate your shrubs and bushes. If you want to create a comfy and inviting spot outdoor, then festoons are a brilliant way for illuminating nooks and corners. Festoons are seen lighting up the outdoor in the given picture. These are attached to trees and offer warm glow that adds a romantic touch to the ambiance. The outdoor also features tents whose entrances are also decorated with string lights. The whole atmosphere is pretty soft and pleasing. This garden seating nook has been decorated warmly using strings of festoons and lanterns. The bench placed in the spot bears rustic tones. Stylish throws are placed on the bench in a very casual manner. The beauty of this seater doubles up with a festoon string wrapped up above the bushes that form a canopy over it. The decorator has also placed lanterns with LED candles flickering gently to radiate warm glow. The pond in front of the seating nook is seen reflecting the illumination very romantically. A pathway in a garden must be marked with proper lighting so as to allow the walker to navigate it without tripping over. There are many ways to light up pathways. One such way is to use offset lighting. In this kind of pathway lighting, the light fixtures are planted in the garden bed. In the picture above, the tall offset light fixtures are planted at quite a distance from each other and gently guide you towards the path. There are many types of outdoor lighting for backyard, one among which is floor lighting. The fire-pit in the image above is a cozy nook where family and friends gather together and spend some leisure time. The spot would have appeared dark and dim had the decorator not installed floor lighting around it. The floor lighting around the fire-pit makes it look inviting with a subtle glow emanating from the flooring. This type of lighting helps in marking the parameter of your fire-pit or any other feature like a deck. Pathway lamps lend a pleasing touch to your outdoor. These help in marking the parameters in a very stylish way. You can either use same styled lamps or can also mix different styles to bring in added doze of chicness. The lamps seen above have an elegant flair to them. They have a dark facade and are metallic in texture. While, on one side of the pathway, the lamps look identical, the other side features a not so identical lamp, though, the texture is the same. The cracked logs above are stunning light fixtures used to illuminate the backyard garden pathway. These look unique and have been designed by a man called Duncan. The logs have cracks in them and are rustic in style. 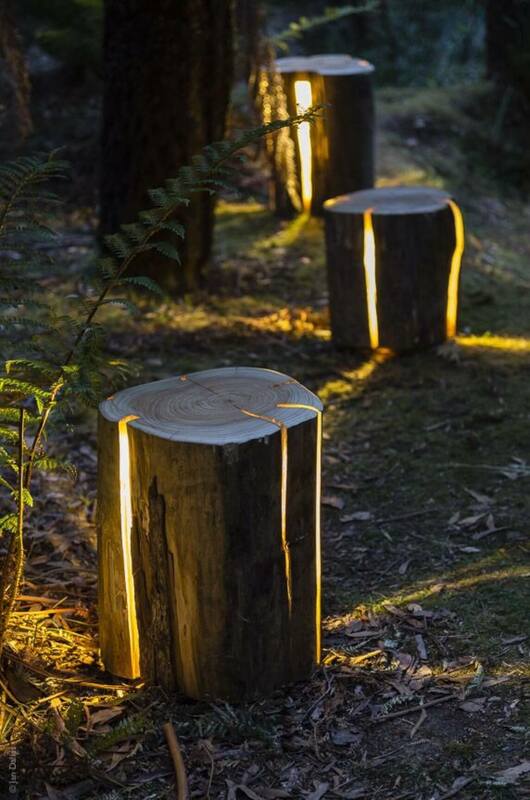 The designer has placed yellow light bulbs inside these logs to radiate warm glow to the pathway. If you don’t get these beauties in any shop, you can create your own cracked log lights by salvaging wood from forest or junkyard. Use tools to make the cracks and install LED light bulbs along with the wiring. Then install these at your designated places outdoors. Lights for backyard come in different styles and textures. String lighting is a very popular and cost effective way to light up your backyard patios. The seating nook in the yard above gets a stylish makeover with a tree transformed into a centerpiece of sorts. It is wrapped up with string lights which radiate soft glow to the entertainment spot and make the ambiance lively and vibrant. Apart from the string lights, one can see lighting behind shrubs that offer spot lighting. You can make your courtyards party spots by using a variety of lighting. Seen above is a glamorous looking courtyard that has been decked up with festoons as well as lanterns with built-in LED candles. In this courtyard, the decorator has used the concept of layered lighting. While, the flooring is adorned with lanterns to offer ambient lighting, the top is decorated with festoons. The shrubs are illuminated with string lights that offer a warm glow to the near by areas. The ambiance of this courtyard looks very pleasing. If you are trying to find innovative ways to illuminate your outdoors, then try the concept of moon lighting. This kind of lighting is done by installing light fixtures high up in trees. This is done so as to mimic the effect of natural moonlight. The trees in the garden above have been decorated with moon light fixtures that lend a very surreal touch to the ambiance. The whole atmosphere makes you feel as if you are in the forest amidst natural elements. This type of lighting also eliminates the use of pathway lights. Lighting up the fencing of a backyard is a simple way to add pizzazz to your outdoor seating area. Just assemble a few benches and tables, throw in some pillows and fabric, then, line the top of the fence with string lights to illuminate the atmosphere. 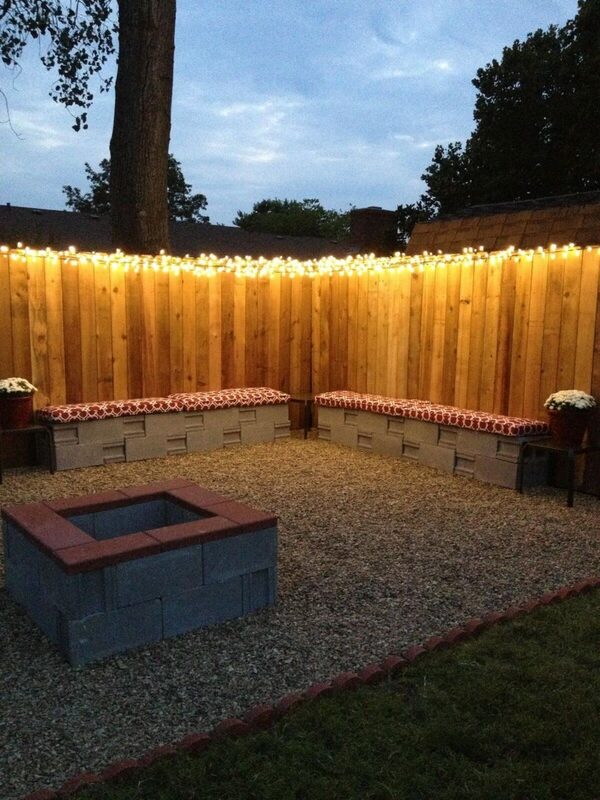 The backyard seating spot above looks cozy and very lively with a lit up fencing. The decor is kept simple. In case you are looking for fantastic lights for backyard illumination, then do try using candles and wicker lanterns for recessed lighting. The backyard seating spot above has been themed on wood and looks very natural. The beauty of its decor is getting a major uplift with recessed lighting offered by candles that are lit up all around. The soft glow of the flickering candles makes the ambiance warm and infused with romance. Candles, either placed on tabletops, or hung from trees, trellises or canopies, lend a soft and ethereal touch to any decor. If you are planning to host a dinner party outside, then the best way to light the area up is to hang lot of candle filled mason jars from your canopy or umbrella. The decorator has done exactly this and has created a magical heaven in the outdoor seating above. You can use wine bottles or other kind of jars for placing candles. Now a days, you can buy really stunning light fixtures that are just extraordinary. Seen above is a backyard garden that has been decorated with ‘glow in the dark ‘planters. 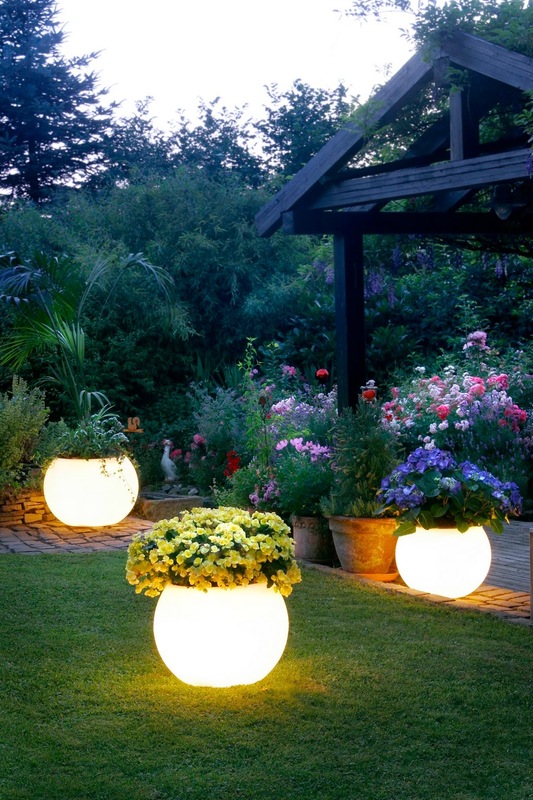 These orb shaped planters don’t emit light in the day. But, as soon as dusk sets in, these start to glow instantly, thereby, illuminating the nooks in a mellow way. 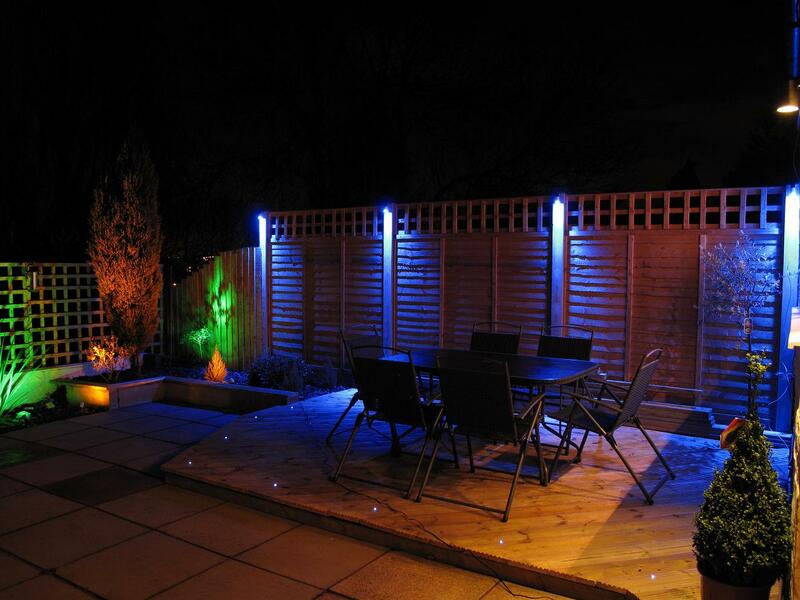 Glamorous backyard LED lighting is seen in the image above where the backyard’s fencing has been decked up with LED lights of different colors and styles. While, the fencing is illuminated with white LED lights, the corners are fitted with colorful LED lights that radiate soft glow. The whole area looks very pleasing and inviting. 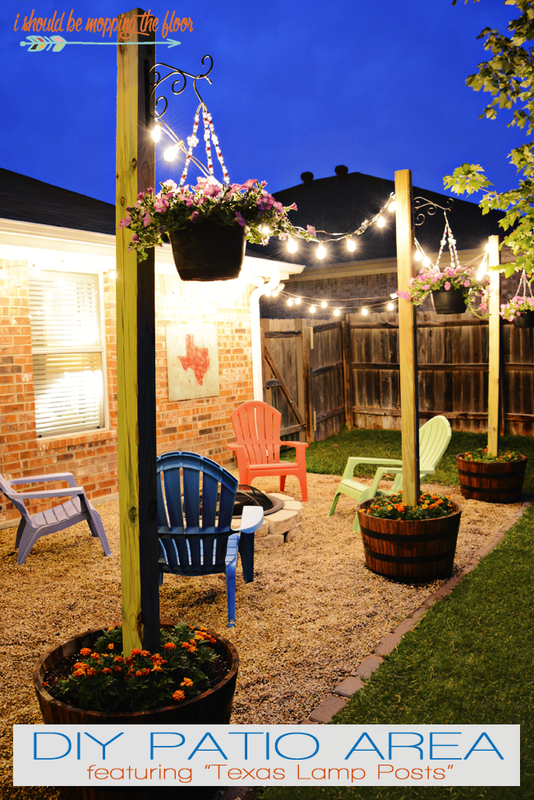 Your backyard pergola can be made more welcoming when you deck it up with string lights. The pergola seen in the picture above looks fit for hosting friends as it is well lit up and looks quite bright and warm. String lights are decking up the roof while the outside is adorned with white globe lanterns. 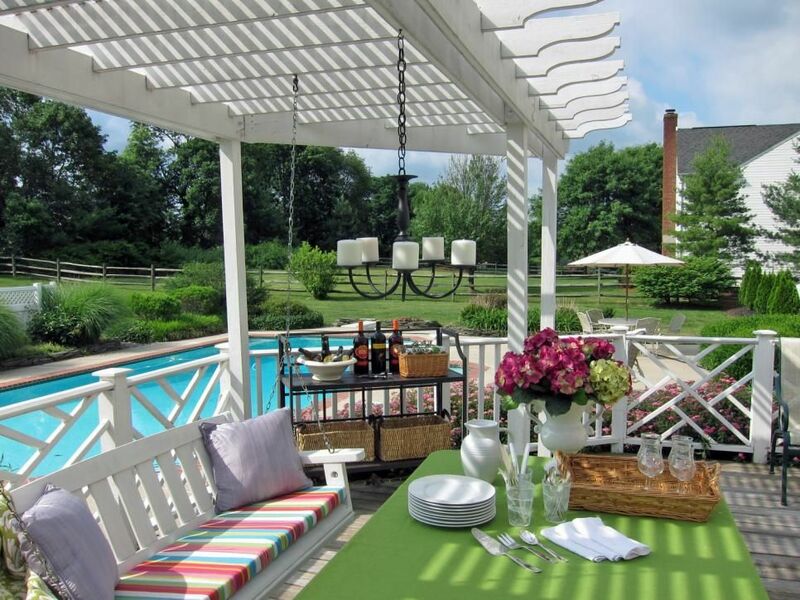 The setting of the pergola seating is romantic and very stylish. Texas backyard lamp posts are seen decking up this awesome looking patio. These posts are adding a cool touch to the ambiance of the patio of this house and are adorned with floral hanging baskets coupled with glowing string of bulbs that are radiating warmth and brightness all around. These lamp posts are fitted inside floral planters and lend a soft touch to match the rustic tone of the wooden lamp posts. This is a very unique and creative DIY idea you all can try in your backyards and patios. Use old and discarded wine bottles to be transformed into torches. All you need are empty wine bottles and some supplies for assembling the torches. You will get all your supplies from any store like Amazon along with instructions. 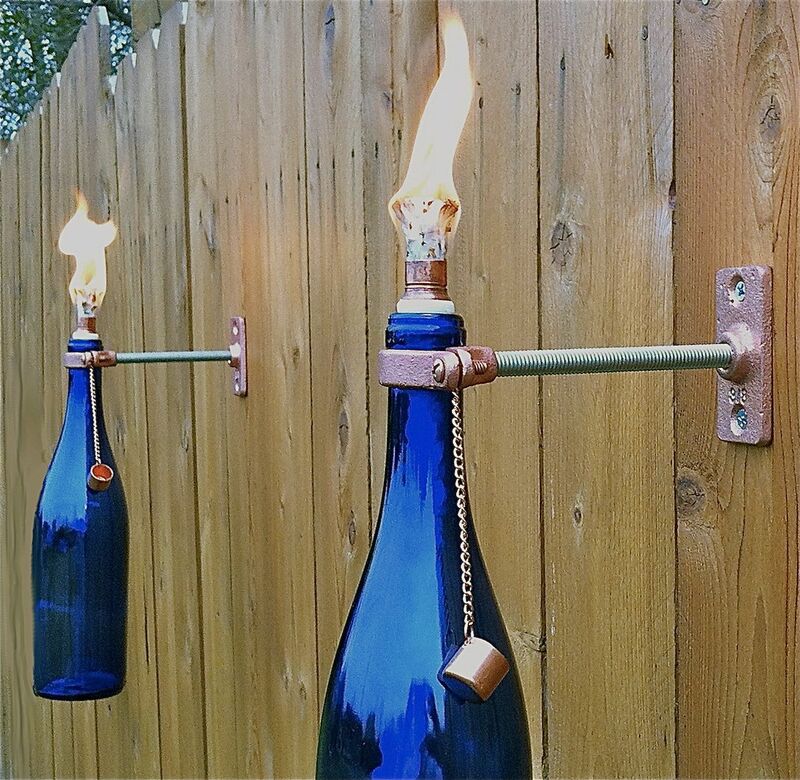 These wine bottle torches look very sassy and can be attached to the fencing of your backyard or patio. Seen above are gorgeous backyard lamp or pendant shades that are lending a very soft glow to the atmosphere. These shades are assembled using candle holders and pendant light fixtures. The shades have been designed by a person called Jamie Durie who has cut out the bottoms of the candle holders. Then, he has wrapped these around pendant light fixtures. The design of these hanging shades is such that these offer special lighting to this outdoor space. Candles are often the most preferred choice in outdoor lighting. Be it your courtyard, backyard, patio or pergola, you can use candles in every form for illumination purposes. 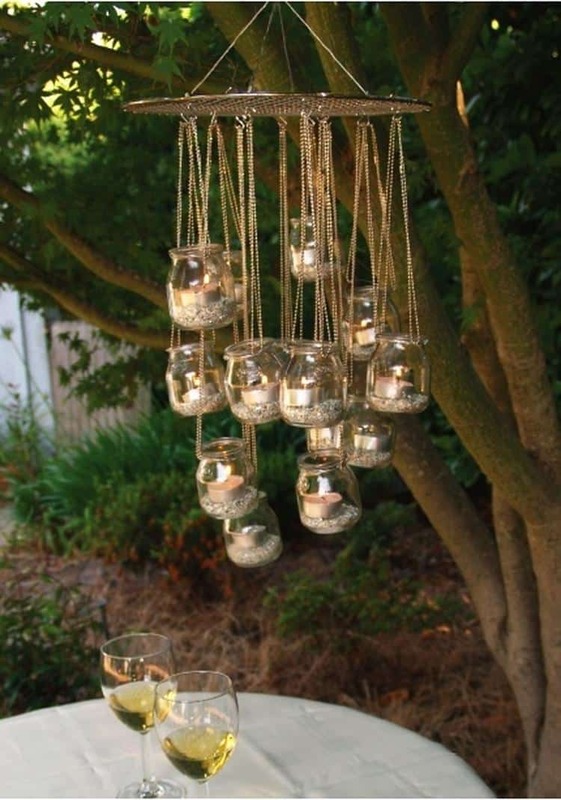 The idea above lets you use your old chandeliers and gives them a new look with battery powered candles. The candle lit chandelier looks pretty suave and needs no electric connection. The glow from the candle chandelier is enough to make the seating nook comfortable and bright. Moroccan lanterns are always in fashion when indoor or outdoor lighting is concerned. The reason why these are so popular is that they look unique and spread a Mediterranean feel to any kind of decor. Seen here is an outdoor seating spot that’s stylized with a hanging Moroccan lantern as well as candles. Moroccan lanterns come in a variety of styles and designs, and are available in different price range. You can fit decorative candles or LED candles inside these lanterns for a soft radiance of light. There are different styles of outdoor lighting for backyard available these days. One of these ideas is to use Moroccan themed lanterns of varying sizes to light up your steps. With these ornate lanterns of Moroccan descent, you can light up the steps of your backyard or garden in the most glamorous way. Simply arrange these one after the other on steps in any fashion as you like, and see the magic unfold before your eyes. The chandelier with hanging mason jar tea lights looks fantastic and can be hung atop your pergola or your umbrella above a dining table, or from a tree. Its a DIY project anyone can do at home. First, buy a metallic plate from which to hang the mason jars. Hang the plate from the roof or tree using a wire. Now, prepare the glass jars by filling them a little with small stones. Then, place tealights on top. Afterwards, wrap wire around these jars and then, put chains of varying measures. Lastly, hang these jars from the metal plate. How would you like to use layered up lighting for your pergola or patio? Well, you can try this idea shown above where the pergola is decked up with strings of bulbs and lanterns. The parameter of the pergola features these two light fixtures, whereas, the pathway leading to it is illuminated with gate lights on either sides. 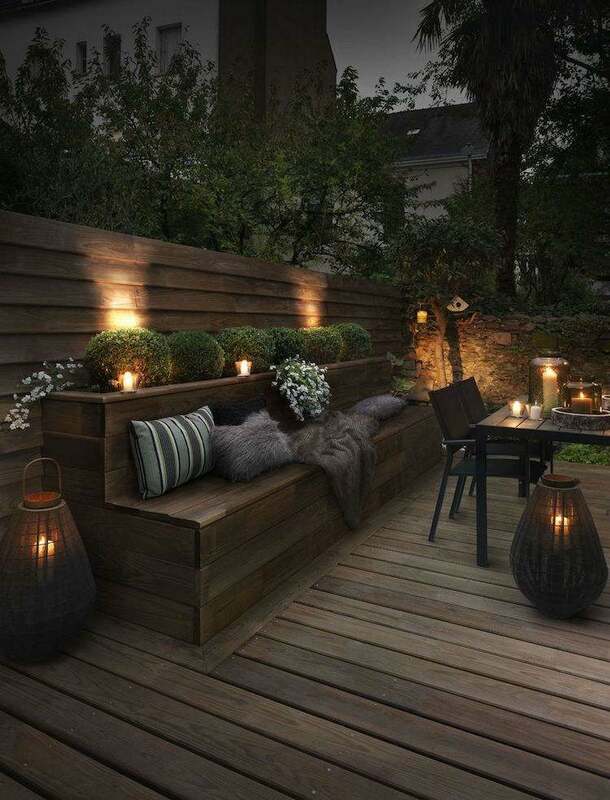 The layered up look suits this outdoor nook and makes it look romantic and comfortable. Your backyard garden can now be made to look party prepared with these amazing string lights that are seen wrapping up the trees in the picture above. If you have trees in your backyard or garden, then you can use their trunks to wrap string lights and illuminate them. Place your chairs and make a comfy seating for friends and family. Seen above are fabulous looking outdoor decorative lights that are spreading cheerfulness and vibrancy to all corners and nooks of this backyard seating. The massive tree stands as a centerpiece behind the seating spot and is decorated with string lights as well as rattan lanterns with LED candles. These two features are aiding in lending a romantic flair to the private seating nook. You can adopt this idea as its pretty easy on the pockets too. String or fairy lights can be used in myriad ways to light up dark nooks and spots in creative styles. 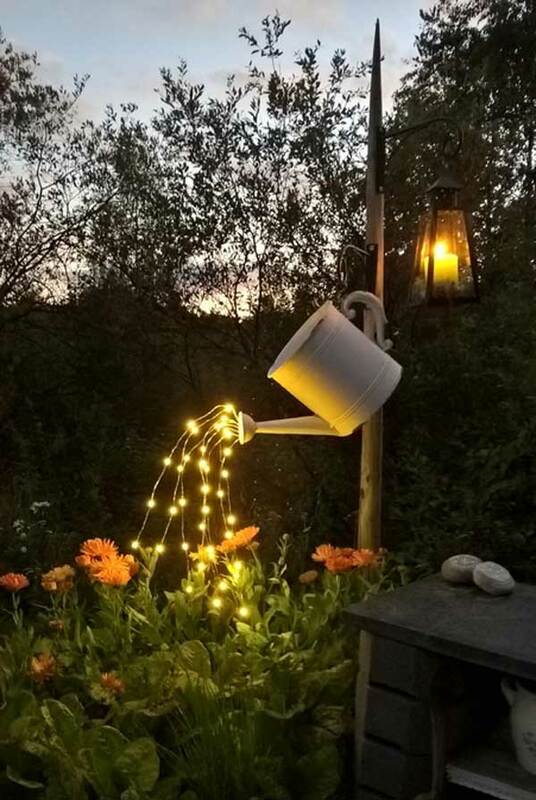 Seen above is a backyard garden where the owner has used a watering can as a light fixture. The mouth of the can is fitted with string or fairy lights and offers a bright glow to the area. Hang the watering can from a lamp post as shown above. The back deck of your house needs to look as comfy as any other spot, and the simplest way to add some dazzle to your deck is to style it up with string or fairy lights. This cheap but amazing idea shown above makes use of string lights and lends an elegant feel to the air. Try this easy breezy idea in case you are a little tight with money. Use old and discarded tin cans as light fixtures for lighting up your outdoors. The idea above is DIY and makes use of old and rusted tin cans. The designs seen carved on the bodies of cans look artsy and can be done using a few basic tools and some creativity. Place LED lights or candles for a flickering effect. Hang these tin cans from trees or any structure on your deck, patio or backyard. Globe lights add a funky touch to your garden pathways and backyards. Place these white globes either on sides of the pathway, or on garden bed near some tree or shrub. The picture above is of a backyard which has been lit up beautifully using ubiquitous globe fixture emanating warm glow. Use such outdoor decorative lights that can be used again and again. If you have holiday lights at disposal, and are not sure how to use them at other times of the year, then try this idea on your backyard patio. The image shows a patio that has been beautified with trendy accessories, not to forget mentioning about the impressive holiday string lights that are hung in a simple way. The lighting creates a comfy place to sit and chat and makes the seating nook party ready year round. 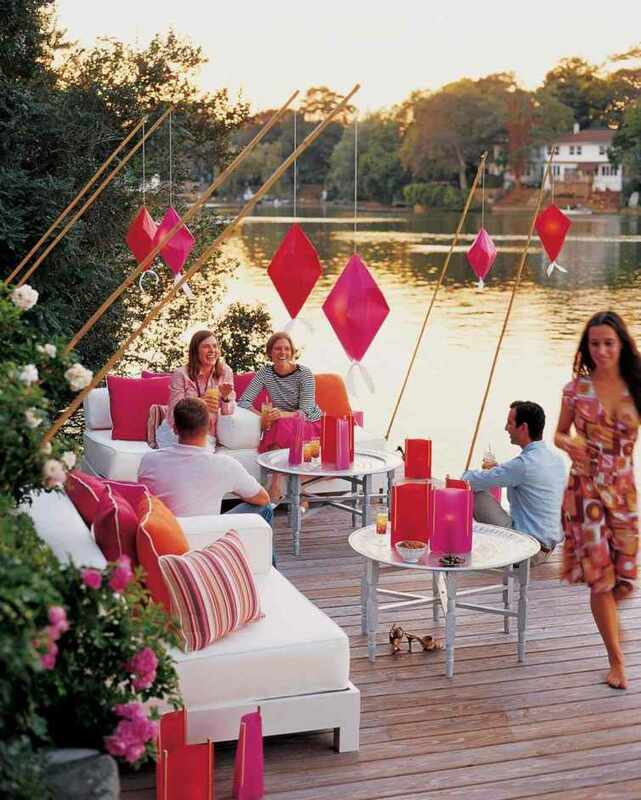 Any outdoor spot can be made to appear party ready instantly using beautiful Chinese lanterns as seen above. These lanterns come in different shades and lend a romantic feel to the ambiance. You can team these lanterns with string or fairy lights to create an enchanting spot for get togethers. Mason jars are popular outdoor lighting options. You can create your own homemade light fixtures with old mason jars and some candles. The warm glow of the flickering candles from the jars helps in creating a comfortable spot and also makes the atmosphere romantic. Hang mason jars from branches of trees or simply arrange them on tabletops. Seen above is an outdoor seating area that has been lit up subtly using an arrangement of glowing shells. Simply, collect and assemble shells of varying shapes on a tray. Fill it up with sand or stones and then place votive candles inside these shells. Place the tray on a table. The light emanating from these candles will offer ambient lighting and will create a serene ambiance. If you have a deck near a lake and wish to illuminate it with style, use vellum shields to light up. Summers are perfect to host evening parties and its the best time to flaunt all sorts of light fixtures for grabbing attention. Vellum paper shields seen above are Asian themed and are fitted with glass holders holding votive candles inside. The soft glow of the candles can be seen on the vellum shields. 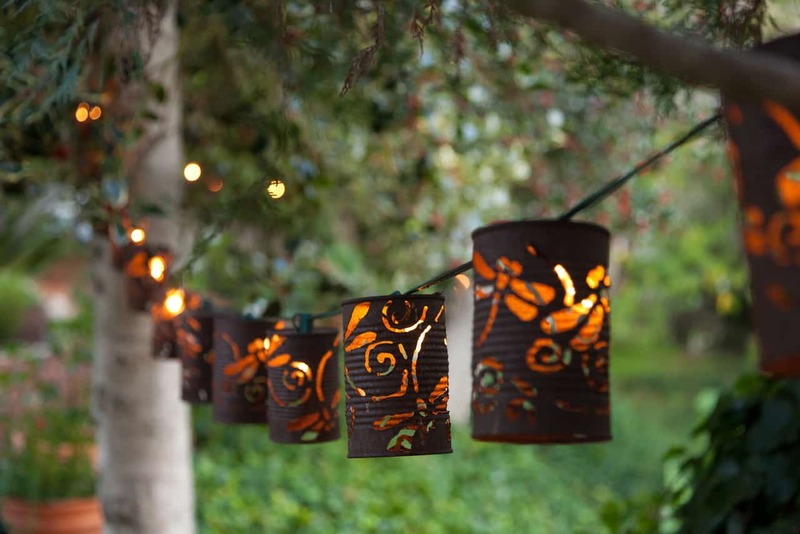 Origami lanterns come in various shades and shapes, and are a popular outdoor lighting choice. You can use different styled origami lanterns and fill votive candles inside. Place these either on tabletops, or hang these from bamboo poles and trees. The soft and pinkish glow radiating from these lanterns is simply astounding and will make the ambiance very romantic. The ornately designed globe lanterns seen above look astonishing and are perfect for lighting up your outdoor. These can be hung from trees or from posts erected in your garden and then fitted with LED or battery powered lights for instant illumination. We are hopeful that you will try out at least a few of these gorgeous outdoor decorative lights this year as these are simply mind blowing! These fixtures help in spreading warm and comfortable vibes all around and make your outdoors more enticing than ever.